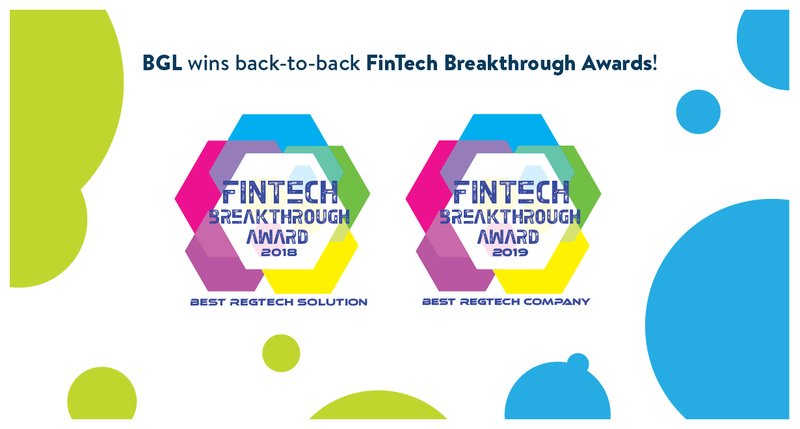 BGL has been recognised as Best RegTech Company in the 2019 FinTech Breakthrough awards. FinTech Breakthrough is a world wide independent organisation that recognises the top companies, technologies and products in the global FinTech market. This is the second consecutive year BGL has been recognised as the world’s Best RegTech Company. “Over the year BGL Corporate Solutions has grown and evolved into the leading provider of SMSF administration and ASIC corporate compliance cloud software solutions, with over 8,000 clients in 15 countries now using its product suite of compliance solutions,” said James Johnson, Managing Director, FinTech Breakthrough. “As a two-time FinTech Breakthrough Award winner, BGL Corporate Solutions has shown a strong commitment to delivering innovative compliance and regulatory solutions and we are delighted to name the Company our RegTech Company of the Year in the 2019 awards program. Congratulations on the well-deserved industry recognition!” added James. “Last month, BGL was also received an Australian Achiever Award for Excellence in Customer Service – for the 13th year in a row. This must be a record!” added Lesh. “I think the numbers say it all” noted Lesh. “We now have over 180,000 funds on Simple Fund 360 and over 330,000 companies on CAS 360. And we keep innovating, investing and delivering with over 40 cloud software releases in the past 12 months. 2019 will be another huge year for our clients”. Part of Tech Breakthrough , a leading market intelligence and recognition platform for technology innovation and leadership, the FinTech Breakthrough Awards program is devoted to honoring excellence in Financial Technologies and Services companies and products. The FinTech Breakthrough Awards provide public recognition for the achievements of FinTech companies and products in categories including Payments, Personal Finance, Wealth Management, Fraud Protection, Banking, Lending, RegTech, InsurTech and more. For more information visit FinTechBreakthrough.com.